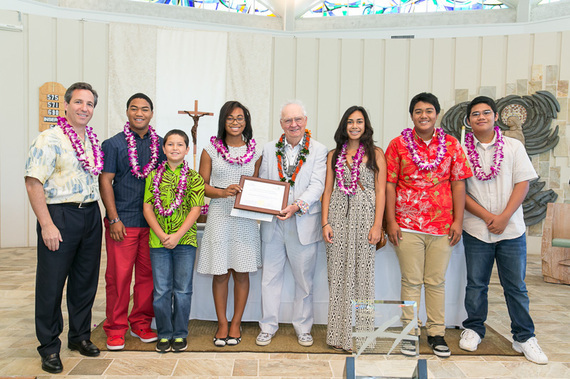 Hawaii Island produced several winners in the recent American Savings/Hogan Nonprofit Business Plan Competition. Among the finalists were the Big Island Substance Abuse Council, the Boys and Girls Club of Hilo, the Food Basket Inc. and the PTSD Health and Research Center, all fielding innovative, worthwhile projects that address critical community needs. They were among the eight organizations, including Ho`oulu Pacific, Blue Planet Foundation, Pacific Gateway Center from Oahu, and Imua Family Services from Maui, that made it to the finals. Ho`oulu Pacific which took the top prize of $12,000 for their Waimanalo Aquaponics Project. Their affordable backyard aquaponics system is designed to help restore subsistence agriculture and give people access to healthy food. Big Island Substance Abuse Council which received $8000 for their Food Truck Training Initiative. This expands their successful Po`okela Vocational Program to provide crucial on-the-job training for their clients that will help sustain their recovery. Blue Planet Foundation's WEfficiency, an online crowdlending platform took the fourth place prize of $2000. Their project allows nonprofits to broadcast their energy efficiency funding needs to a "crowd" of supporters and pay them back from the energy-savings made possible through the upfront donations. The other finalists each received $1000 for their very worthwhile projects. Clearly the finalists all had compelling projects. But there was no question that the poise and earnestness of the teenagers from the Boys and Girls Club of Hilo stole the hearts of the judges in a special way. Hogan Advisory Board member, Robin Campaniano, who was one of the judges, spoke for all in reminding the young group that they needed to work on developing a proper financial plan. But he also echoed the general sentiment that "the leadership exhibited by the presenters" and their approach to translating into action their philosophy of "take what you need, give what you can" made everyone feel very optimistic about their future. The success of the 13-16 year old presenters from the Boys and Girls Club of Hilo was one example of the opening up of space for more voices that career grassroots advocate for the public good, David Cohen believes in. Cohen, who has been called "the preeminent voice of public advocacy," was present for the Graduation of the 12th class of Hogan Entrepreneurs and Induction of the 13th, and the announcement of the winners of the 2014 Nonprofit Business Plan Competition at the Mystical Rose Oratory at Chaminade University on April 23. He was honored with the Hogan Lifetime Achievement Award for a career devoted to advancing the common good through constant, always civil, engagement. He found much to celebrate in the many promises the new entrants to the Hogan Program made, as each publicly spoke of their desire to improve themselves, learn the skills of leadership and help improve their communities. Chaminade President Br. Bernie Ploeger, S.M. 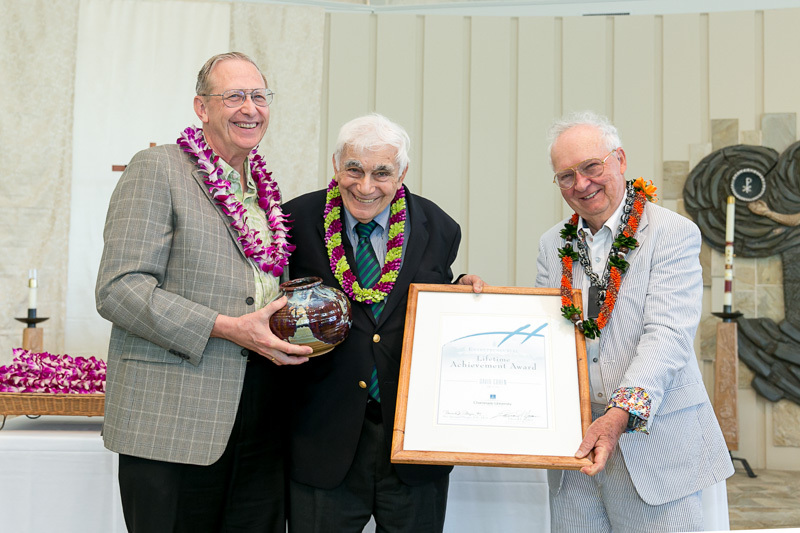 Ph.D. (left), and Ed Hogan (right), presented the award and a special vase created by celebrated artist, Yukio Ozaki to David Cohen (center). As someone who advises the Campaign for Tobacco-Free Kids, which is dedicated to reducing the toll from tobacco use and secondhand smoke in the United States and around the world, Cohen was encouraged by the commitments this group of young people were willing to make publicly. The strong representation of women in the group was also a good sign: "You do more when you open things up," he said. "We couldn't be more proud of what our students have accomplished," said Dr. John Webster, Director of the Hogan Program. 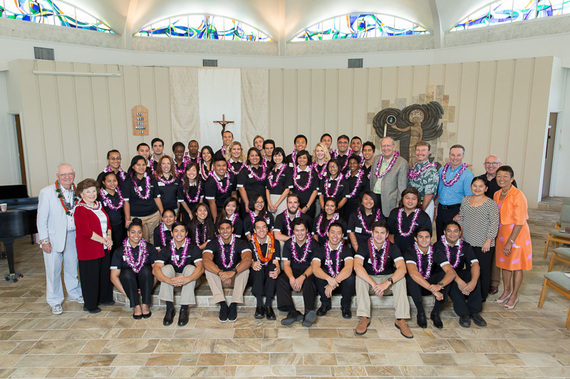 "Thanks to the generosity of the Hogan Family Foundation, and project partners like American Savings Bank, as well as the many local business and nonprofit leaders who support what we are doing, Chaminade University has been able to give students an avenue to find creative ways to do social things that make business sense, and business things that make social sense. After more than a decade, there is real joy in seeing the results. The Hogan entrepreneurs -and our nonprofit winners--really make our program promise--and Chaminade University's larger mission of preparing people for life, service and successful careers, come alive," he added.